The mission of internet fraud and money laundering scams came to an end for two suspected Nigerian men based in London. 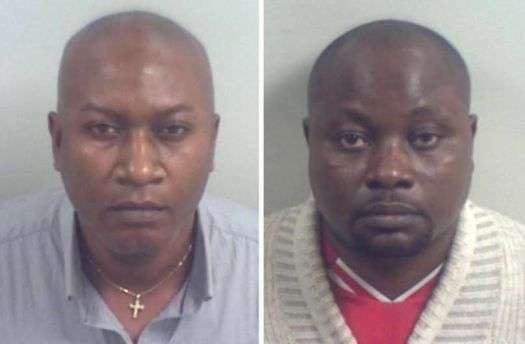 According to reports the suspects Emmanuel Adanemhen, 50, and his brother-in-law Eduwu Obasuyi, 40, will be jailed for 14 years for taking part in a 25 million pound Internet fraud involving victims from 55 countries. The suspects who are big time fraudsters use fake identity to open bank accounts to launder funds from bogus schemes, which included dating website scams, false inheritance scams, overseas lottery wins and shipping frauds. One of the con men Adanemhen was arrested by the police and was force to lead them to his partner in crime Obasuyi, of Friern Road, East Dulwich, who was about to board a plane from London to Lagos, Nigeria. “This was a highly sophisticated criminal enterprise with Emmanuel Adanemhen and Eduwu Obasuyi at the heart of operations. Victims of their fraudulent activities ranged from the elderly and vulnerable from different part of the world, they own a £4 million worth bank account, they transfer money between countries including Germany, Norway, Switzerland, New Zealand, Canada, United Arab Emirates and across the USA. The police estimated the total amount that have been conned from their victims to worth more than £25 million. Adanemhen and Obasuyi admitted to conspiracy to defraud, conspiracy to enter into a money laundering agreement and three counts of fraud against the Home Office and the DVLA, which related to Adanemhen fake documents where he changed his identity to that of deceased Portuguese. They will serve seven and a half years each in jail.